Here is a great example of how perfectionists think they have to write a perfect blog post when they don’t have time to even do a modest one. Today I need to write a blog since I’ve only done one this week and my goal is to do three each week. Since the day is a busy one, I looked around for a topic I could do quickly. That’s when I discovered my perfectionist was elbowing her way into the decision making process. She wanted me to select the exact one that meets the criteria of being topical, easy to write, and brilliant (well, what would you expect from a perfectionist other than brilliance?). For some reason my perfectionist thought that if I didn’t write a really great post you wouldn’t get your money’s worth. So she began by suggesting I write about the Hadza, a tribe deep in the African bush, which I’ve been reading about in the National Geographic Magazine. These hunter-gatherers subsist almost exclusively on what they forage or kill and seem to be happy. Despite what would seem like a harsh life to us, the author, who spent some time with them, including going on a baboon hunt, says, “I envy how free the Hadza appear to be. Free from possessions and most social duties. Free from schedules, jobs, bosses, laws, news, money. Free from worry.” That would have been an interesting topic but I didn’t have time to do it justice. Once the perfectionist started giving me other ideas, I forgot to call on my recovering perfectionist to shove her out of the way and just settle on a simple topic I could do quickly. Instead, the perfectionist said I could do a piece about “Quotations Worth Considering,” a feature I plan to have as a fairly regular post. Actually, it wouldn’t have taken that long, but she thought I had to find just the “right one” to begin the series, and I certainly didn’t have time for that. Then the perfectionist thought I should take the advice of my co-webmaster, Renee, who has a popular blog about books and has long said that I should be commenting on the blogs of others. That means I have to take time to read them and I don’t have time today. Eventually I was able to put the perfectionist in her place and let these comments about the process of choosing a topic suffice for a post. I won’t even succumb to the typical perfectionist tendency to explain why I am busy. Instead, I will simply say this ain’t as good as I would have liked when I began writing — and hope you manage to get through your day without reading a blog that will change your life. However, I do like one thing about this post. 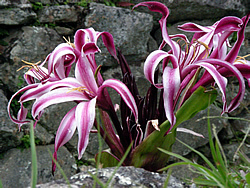 I like the inclusion of the picture of a flower I took at Macchu Pichu. It will be part of a video I am doing with the new Vegas Movie Studio program I recently bought. A flower “perfectly” illustrates a post on perfectionism because flowers are perfect. Why? Because they just “are” without trying to be something else. Even among the rough stones of the Peruvian Andes, they accept their existence without trying to be better or justifying their existence. Do you think maybe I could learn something from flowers?